First I cut black strips of paper the width of the sandwich bag tops. They a cut the same shape White just added a curved top you can see above. He sat and drew the nose with a marker. As he fished out eyes I glued them on. I also cut a creative border on the bottom of the black rectangle pieces to give it a festive look! We let them dry about 5 or so at a time. This helped keep a steady flow and we did not get bored with the same job over and over again. We placed equal amounts of treats in the bag along with a "Merry Christmas" tag. I simply stapled the penguin parts together securing the bag. These are so easy to make and were a HUGE hit at my sons Christmas Party! 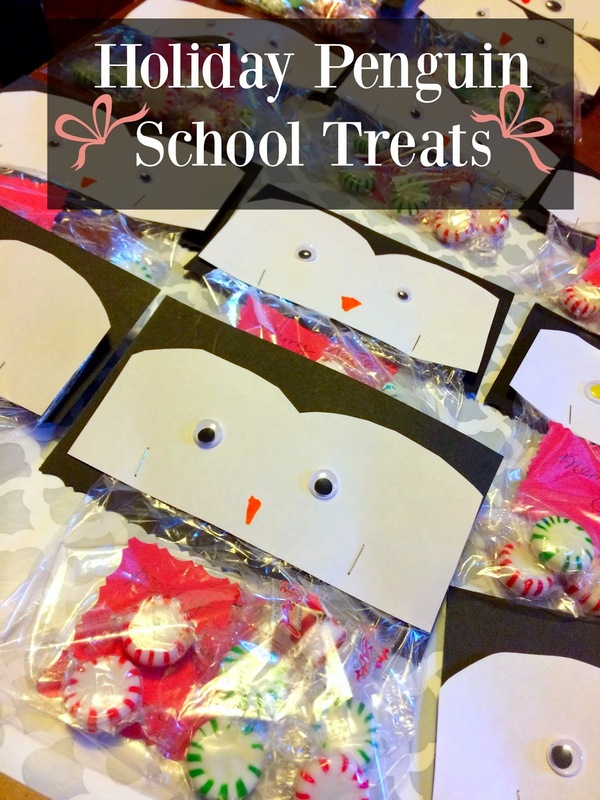 Do you send treats to school with your kids?